[pinit count=”horizontal” url=”https://www.addicted2decorating.com/more-ways-to-make-money-on-a-blog.html” image_url=”https://www.addicted2decorating.com/wp-content/uploads/2012/07/blogging-help-more-ways-to-make-money-blogging-post-pic.jpg” description=”More ways to make money on your blog, part of the Blogging Help series from Addicted2Decorating.com” ]Hello all! Last weekend, I shared the various ways that I make money on my blog, including the amounts that I make with each method. *gasp* I know, I know. I divulged some very sensitive info there. 🙂 And by the way, all of the videos have been added now, just in case you arrived to read the post when I was still working to get the videos uploaded. I must admit that I was very hesitant to hit the “publish” button on that post, because I simply wasn’t sure how that info would be taken. However, I receive nothing but positive feedback on it, so I’m incredibly thankful that each of you clearly understood that my only motivation in sharing it was to shed light on a topic that seems to be shrouded in secrecy, to give you some much needed information as you decide what direction to take your blog (hobby or career), and to give you some idea of what you can expect from your hard work. 1. Turn a project into a product. Have you made a project for your blog that has taken on a life of its own, being shared all over the blogosphere, all over Pinterest, etc.? If so, then you might consider turning that project into a product. You could make the offer open ended (i.e., continue making and selling the product as long as you have orders for it), or you could make it a “limited edition”, creating a certain number of items for sale, and once you run out, that’s it. Sometimes you might find that this opportunity lands in your lap. Quite frequently, I’ll receive emails from readers asking if I’d be willing to make a certain project for them. So when you receive those emails, give it some serious consideration! You never know where it will lead. Allison at House of Hepworths has had success with generating income from a very popular project she posted on her blog. 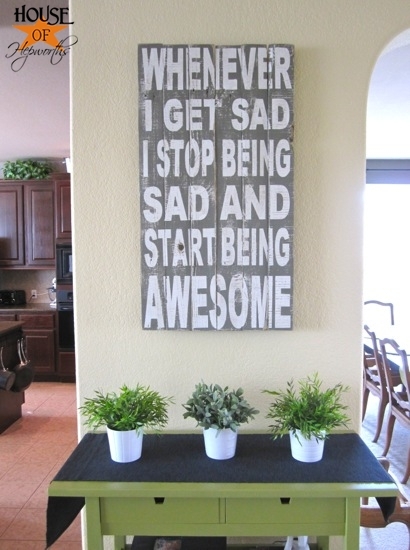 Once her readers saw her “Awesome” typography wall art, the inquiries started coming in. She now offers this as a product…all from a diy project tutorial that she wrote for her blog. If you’ve got the time, you can do that too! 2. Open an Etsy store or a brick and mortar store. If you have many projects for your blog that people seem interested in, consider opening up a full-fledged store! You can create an online store, such as an Etsy store, or you can create a store right there on your blog (which is a bit more work, but you can use PayPal to create a shopping cart, or if you’re on WordPress, there are shopping cart plugins you can use). The idea here is that you can use the popularity of your blog, and the traffic that your blog already receives, to generate traffic to your store. When people get to know you through your blog (that’s a big key to your store’s success), they’re more likely to want to support you in your business. Many bloggers have had amazing success with stores, but one in particular who who has said specifically that her Etsy income is a big part of her income generated from her blog is Jen at IHeart Organizing. If your dreams include a brick and mortar store instead of an online store, don’t discount the amazing and influential effect that your blog can have on your store’s success. To illustrate this point, let’s talk about Marian of Miss Mustard Seed. Her blog is very successful, with lots of visitors stopping by daily in hopes that they’ll catch a glimpse of her latest creation. Because she’s kind, personable, and down-to-earth on her blog, her readers feel like they know her, and are excited to support her. Not only does this lend to the success of her business located in a brick and mortar store, but it also makes people all to willing to travel long distances (even traveling across many states) during the annual (or is it semi-annual?) Lucketts antique market. I’m sure that Marian would have wonderful success without her blog, but there’s no denying the fact that her blog is a big factor in getting the word out about her amazing creations and getting people excited about being a part of her success. Let’s face it…bloggers give away a tremendous amount of information, completely free of charge. Some would argue that we give away too much information. While it’s completely a personal choice, there’s no reason that a blogger should feel obligated to give away everything for free. If you have a particular area of expertise, rather than writing blog posts about it, you could turn that information into an e-book that you sell on your blog. Your blog will play a crucial part in the success of your e-book. No only are your visitors more likely to purchase your e-book if they feel like they’ve gotten to know you, but if you’ve been using your blog to demonstrate your expertise in an area, those who are interested in the topic will want to purchase your e-book to get the details straight from the expert. 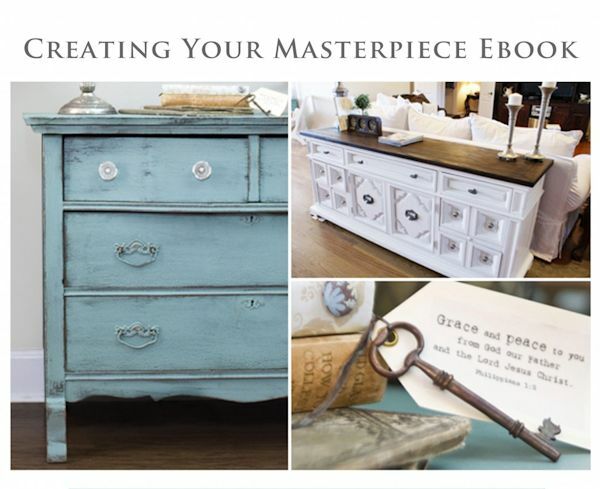 Of course, many bloggers have written e-books, but one that stands out in my mind is Shaunna of Perfectly Imperfect who wrote an amazing e-book about painting furniture. If you read Shaunna’s blog, you know that this is clearly her area of expertise. And while she gives a tremendous amount of information for free on her blog, she goes a few steps further, giving detailed information and laying out the information in a clear and orderly way in her e-book. Do you have an area of expertise? Have you been using your blog to demonstrate your expertise on that topic? If so, then you might be ready to take it to the next level and write an e-book! 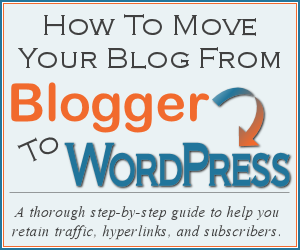 As your blog increases in popularity, these opportunities may be presented to you. However, there’s certainly no harm in you making the first contact! If you come across a blog or website that you really like, and it’s one that obviously has contributors, you can certainly make an inquiry to see if they’re accepting new contributors. I know of many bloggers who write for other sites. I have been invited to do so, but so far, I’ve decided to concentrate only on my own blog. But if you love to write, and find that you have the time to write for other sites as well as your own, this can certainly bring you not only added income, but also increased traffic to your blog. For some reason, I’m personally not a huge fan of giveaways. I generally skip over giveaway posts (I could probably count on one hand the number of times I’ve entered a giveaway), and I rarely host them on my own blog. However, giveaways are certainly popular with most people who read blogs, and they’re also a great way for a company to bring attention to their products. In other words, a giveaway is a great advertising opportunity for a company. Get it? It’s advertising, and not only does the winner of the giveaway benefit, but the company benefits as well by getting the word out about their products. There’s absolutely no reason that you should feel obligated to advertise for a company free of charge on your blog. Considering that giveaway posts take time to write, time to administrate, and the links from your blog to the company’s website will stay active indefinitely, it’s perfectly reasonable to charge an administrative fee to host a giveaway for a company. If you don’t feel comfortable charging for this service, that’s completely your choice. But don’t feel obligated to give away advertising for free simply because the company is giving away a product to one of your readers. I can guarantee you that if a company wants to advertise a sweepstakes or other type of giveaway in a shelter magazine, they’re going to pay dearly for that advertisement in addition to the money or goods that will be given away. YouTube videos are great for many purposes, but since this is a post about making money, let’s talk specifically about that. Did you know that you can place advertising on your YouTube videos? Of course you did. You’ve most certainly seen these ads on videos that you’ve watched. It’s basically Google Adsense for videos, and some bloggers (and non-bloggers) are doing quite well with it. You do have to apply with YouTube, and there are certain restrictions (e.g., your videos can’t contain any copyrighted material), but once you’re accepted and you agree to abide by their rules, you’re good to go! 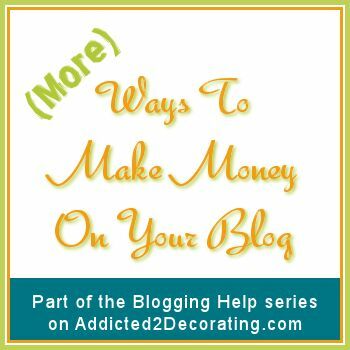 So that’s my complete list of ways to make money on your blog. Last weekend I shared what I personally do to make money blogging, and the ones above are things that I have yet to try. By no means is this meant to be an exhaustive list. There are hundreds of ways to make money on a blog, and you’re really only limited by your imagination. Have you thought of something that I’ve left out? If so, I’d love for you to share!! Next Post Make It Happen Monday -- Have You Seen This Fabric? Always educational, Kristi. Thanks so much! But your honesty and transparency and handing over your knowledge and your digits is so greatly appreciated! These posts have been so encouraging and informative for me. Seriously. Thank for being so generous. I can’t tell you how much I enjoyed reading both of your posts on how to make money with you blog. My blog will probably never have enough visitors to make money but I have always wondered how bloggers were making money. I had no idea there were so many options and now I will be watching for the various ways you discribed. Kristi, I truly believe you will be blessed for your generosity in sharing information the way you do. Thanks for sharing your wealth of knowledge – you sure you don’t want to write an e-book on this?! Thanks again!! Really, really helpful! Your two-part series has been excellent! I gasped when you said you were going to announce how much money you make, but I’m so glad you did because it’s a good way for us to gage where we should be. I am so glad you are so willing to be so open and transparent. It really is so helpful and beneficial for all of us. You are seriously my blogging idol. I always turn to your blog when I need blogging tips or advice and your layout is top notch. Thanks for all you do. I really need to corner you and make you give me some pointers! Hey, if you are up for it, I’d seriously love to drive to Waco and get some one-on-one blogging help from you. You just have it all together. I don’t know if you are open to that, but if so I would love it. Ben is in the middle of moving me to the Genisis Framework (Lifestyle theme) but we are still in the testing environment and not ready to make the switch yet. I’d really love some tips if you have any to share. Also, I you you yet another huge THANK YOU for always being so kind to mention me in your posts and show off my blog posts and projects. Your generosity does not go unnoticed and I am truly grateful for your support. I admire your way to approach to the people and share generously your knowlegde about this matter (blogging) I am here because I am seriuosly thinking in create a blog about decoration and design.Thanks very much to be there. OH!! your DYI is fantastic. I am a big addict to repurpose, reuse and everything that means respeict for the nature and enviroment. Thanks so much for this series, it’s been the most informative one that I’ve read. My mom and I have been blogging since February and we just recently started monetizing. We only have offered sidebar ads, used affiliates and done one giveaway. I am so glad you divulged all of this information because there were so many things that I wasn’t quite understanding, like what exactly an ad network was or how much was a good rate to charge for a sponsored post. I think we are on the right track, we are taking it slowly but now you have given me an idea on what to focus on and what my next steps are going to be in our journey to make money blogging. Thanks so much, Lesley. Thank you so much for these two posts. I’m getting closer to creating my blog and I appreciate your willingness to help the newbies. I so wish I could sit down with you when I set up my blog!!! I was wondering if you might be able to help me understand Adsense. I started my blog on Oct. 25, 2012, not quite 90 days ago. I keep applying for an account, and I keep getting a message that says my account has been disapproved for inactivity or a policy violation. It tells me to correct the problem and reapply for an account. I can’t figure out where to go for help, or to even ask a question. I have no idea what I am doing wrong. Or is it just because my blog is not 90 days old? Or because I don’t have enough followers? I honestly don’t know where to go from here with it, I was hoping you could give me some advice. When I speak to a group, when I lead a Bible Study, when I write for my blog, I try to be open and transparent. It is refreshing to see someone else willing to be honest and open also. Although my blog is brand new, I have been planning it for a couple of years. Thank you for your inspiration and encouragement in the world of blogging. Thanks so much for writing this! I have been going off these tips for a long time, and I have a question for you….Did you ever encounter an issue with adsense? I have been making a decent amount on adsense and then over the last week my earnings have dropped off! It looks like the CPC rate has gone down substantially (I am talking like .05-.15 per click- wth! )…and I don’t know what to do! I have been googling it, but don’t really find any answers. Thought I might pick your brain…. Oh wow, Allyson, I have no idea why that would happen! So sorry! Thank you so much for these valuable insights. I have a new blog and I hope to make it better with your suggestions.